After completing my 20-month study of my basic sciences in medicine, I returned to Canada to study for my USMLE Step I (United States Medical Licensing Exam). My mother requested that I visit our local Murugan temple to thank Murugan for His help during my studies abroad. So, I went with my mother and prayed to Sri Skanda. I cried tears of gratitude and love for the uncountable occassions He had helped me in my life, including when I was studying abroad. So, I sang for Him a Thiruppugal hymn: "naatha vinthu kalaathee namo nama..."
The temple procession went well and I came home content after having seen my Lord Skanda in a temple for the first time in a looooooooooooooooooong time. The reason I emphasize the word "long" is because the place I studied medicine did not have a hindu temple at all, let-alone a Murugan murthi. Hence, I really missed seeing the beautiful hand-carved form of my beloved Sri Skanda. As I retired for the night, I had a wonderful vision. I was back in the Murugan temple. The lights in the temple were on and all the lamps were lit so that I was able to see the deities. However, I saw a familiar face standing just outside the moolasthaanam (the place where the main deity  Skanda  resides). 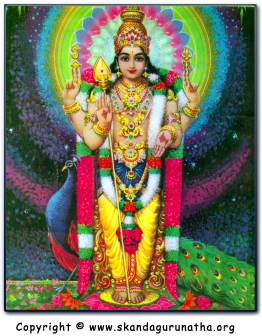 It was Lord Skanda  in the form of the former priest who used to do puja at the temple! He was adorned with sparkling jewelry around His neck and was wearing a wonderful veshti dressed brahmin-style. He raised His right hand in blessing and His left hand pointed to down to His feet  exactly like one of the pictures of Sri Skanda that I pray to [seen above]. I saw His sparkling smile and I immediately fell to the ground and partook paathanamaskaar from Him. I then awoke. I realized that my Father (Bhagavan Sri Skanda) had acknowledged and blessed the return of His son.